Guaranteed to bring some heat into your borders even in the coldest wettest August is Crocosmia ‘Lucifer’. 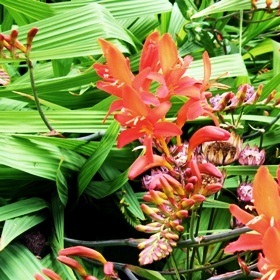 Sometimes referred to by the common name of montbretia. The plant always reminds me of childhood seaside holidays on the south coast, where the pretty red and yellow flowers seemed almost a weed thriving in every garden along the seafront. This seaside plant was rather tender for midland gardens, but with milder weather and improved cultivars no garden should be without their cousins the modern Crocosmia. The cultivar ‘Lucifer’ is a fiery red flowered member of the iris family with sword shaped leaves and flower spikes rising to 1.5 m. It makes a long-lasting and bold contribution to a tropical or herbaceous border in both leaf and in flower, complementing plants such as Iris, Hemerocallis and Phormium whilst contrasting with rounder leaved plants. If Lucifer’s flame red flowers or height are too much for you there are crocosmias of smaller stature with flowers from vibrant orange to a cool lemon yellow – one for every border!